It was bitterly cold, and we never did find what we were looking for, but the night was still a lot of fun. Last Thursday four of us drove out of the city for an evening of stargazing, equipped with a telescope, binoculars, sky charts and heavy coats. 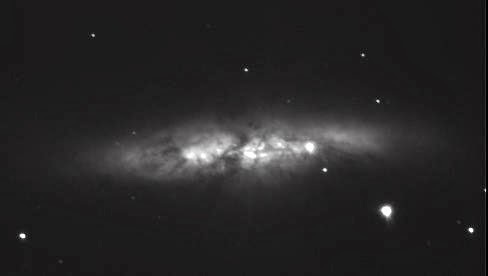 We were hoping to see the recent supernova in the M82 galaxy, but our inexperience, the light of the half moon, and the low temperatures kept us from finding it. Even so, we got a good look at Jupiter and three of its moons, which was still pretty cool. Dressing to stay warm in -20° C is a very different thing from dressing to express one's gender. I suppose I was in "boy mode," but I'd have worn the same warm clothes, out of nessecity, in any gender. What was really nice is that the group consisted entirely of people I'm out to. Somehow I find it much easier to present male around people who know I'm trans than around those who don't. I guess that's because I don't feel like I'm decieving anyone. I've been thinking and writing about coming out to my parents for a long time. Recently I asked my brother and sister-in-law if they'd be willing to come along with me when I come out, to provide moral support. They said of course they would. This will make it a lot easier, not to mention a lot more likely to actually happen. Currently the plan is for the three of us to head over to my parents' place the next time my father is in town, which will be next week. So now there is a definite timeframe for this happening!